You’ve finished your degree. You’re working in your dream career field. You’re living your life and doing the work that’s important to you. Then your country falls apart. And you flee. The next years – maybe decade – are spent in a makeshift camp alongside throngs of people who fled similar circumstances. Finally, the call comes. You’re part of the one percent of refugees worldwide who apply for and actually get resettled, somewhere. Hope blossoms. Then the plane lands in your new country, and you’re no longer the person you were at home. Degrees and experience as a farmer, a doctor, an entrepreneur are no currency here. Even the language you’ve spoken from birth becomes an obstacle to overcome between you and others. An identity constructed over a lifetime has been subverted. This is starting from scratch. If you’re a refugee in the Salem-Keizer area, Luke Glaze might have an answer: Sparrow Furniture, the new social business he manages on Broadway Street. 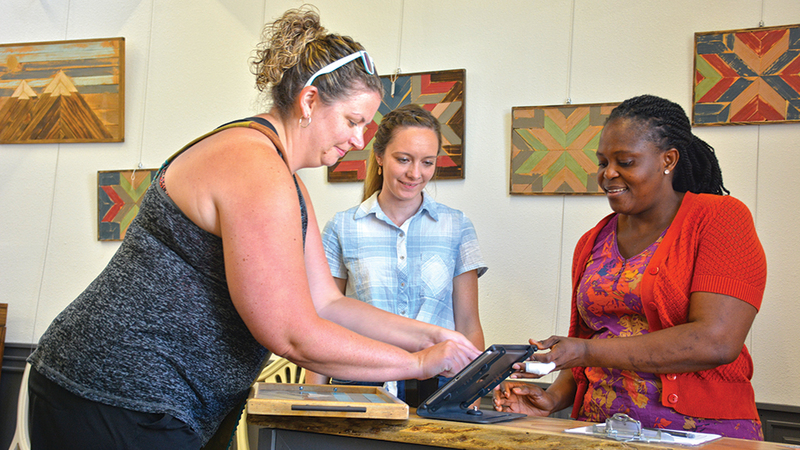 Sparrow Furniture is dedicated to hiring and training refugees in woodworking and customer service skills. Glaze, who also manages Broadway Coffeehouse in Salem, took on the Sparrow Furniture initiative two years ago because he believes people who come to the U.S. as refugees deserve a second chance at success. Sparrow Furniture’s soft opening took place on Friday, July 20, with a grand opening planned for September. The woodworking workshop has been operational for six months, and over the course of that time the business has hired five refugees from five countries: Democratic Republic of Congo, Iran, Iraq, Ivory Coast, Pakistan, and Syria. The furniture they work on is often donated, and much of the work is refinishing, but the employees also work on original designs as well. Now that the showroom is operational, employees are also getting experience in customer service as showroom managers, interacting with customers and making sales. In addition to work skills, Sparrow employees receive English lessons from Mid-Valley Literacy Center, driving lessons in the delivery van, and will soon begin job development classes in resume building and interview skills with ResCare. Sparrow Furniture pays its employees for their time in these classes, so they can build the necessary skills to move on to other employment opportunities 12 to 24 months after starting at Sparrow. The Sparrow Furniture model is designed to be temporary, but in a way that facilitates future success at the end of that one- to two-year period. Blandine has worked at Sparrow Furniture for one month. She’s a refugee from Ivory Coast, a country wracked by land disputes and a brief civil war back in 2011. She left her country five years ago and stayed in Togo, also in West Africa, before being resettled in the United States. In West Africa, she was a businesswoman and entrepreneur. She gestures toward a wall full of woodworking projects, painted in bright colors. Glaze speaks highly of Blandine, her creativity and ambition. But as far as Sparrow Furniture’s employees go, Blandine is unique. Other Sparrow employees have other challenges and barriers to employment aside from their refugee status. But the adaptivity of the Sparrow model means the business can help people for whom the deck is stacked in the wrong direction. “This is a business that can help Blandine who speaks pretty good English already, is an entrepreneur, will find a way to make an income here in this country, but it also helps someone when there’s probably no other place for them other than Sparrow,” Glaze said. To get involved, visit sparrowfurniture.org.